Our floor sanding services are highly regarded and 90% of our jobs come from referrals. Our floor sanding system is very efficient and relatively dust free. All our floor sanding equipment is German made and designed to achieve high quality results. Whatever type of solid or semi solid floor you might have we can make it look like new again. Sometimes, after removing old carpets or vinyl you may find old looking floor boards with little or no hope of ever looking well again. Well, we can make it look like new. 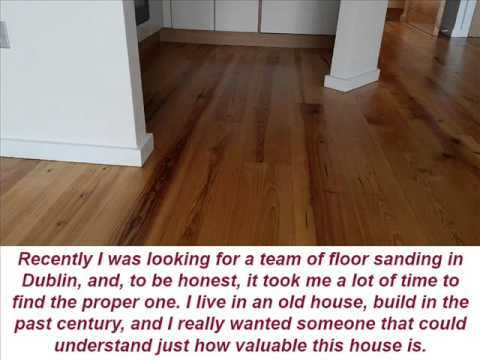 We will sand a few mm from your existing floor and if the wood is not a one tone colour we can stain it for you and following that apply a varnish. We can show you over 50 colours of staining. If the wood is in good shape you can just pick a good quality varnish. Our floor sanding company is highly regarded for the quality of our finishes, fast bookings and work guarantee. We provide professional floor sanding services to a wide range of customers both domestic and commercial. Our company has acquired some of the best floor sanding machines available and we use only the best varnishes and waxes to ensure the end result is of the highest possible standard. Our staff are highly trained, professional and efficient. This has enabled us to reduce costs and make floor sanding more affordable. Our business in based in Dublin. For larger sized floor sanding jobs we can travel outside to the counties around Dublin. We provide free estimates and free advice with all our floor sanding jobs. We are a young team with many years of experience in the building industry. Our website was designed to be easy to use and to contain a lot of good information about floor sanding and other useful information. We only use top of the range dust free floor sanding machines and all our varnishes and waxes are very efficient and long lasting. We will price any job within 24 hours and all our estimates are free of charge. Our floor sanding company is fully insured and all our services are fully guaranteed. We will work with any budget and we will always finish the job within the agreed time. We are professional, helpful and a pleasure to deal with.